I can get caught up into fads just like everyone one else. One fad from 1987 that I was swept up in was the Pogo Ball. I think what appealed to me was that I was not allowed to have a pogo stick. I still don’t have a pogo stick. I would go buy one for myself, but I know that is a straight trip to the hospital for me. My famous last words would be “Look what I can do”. 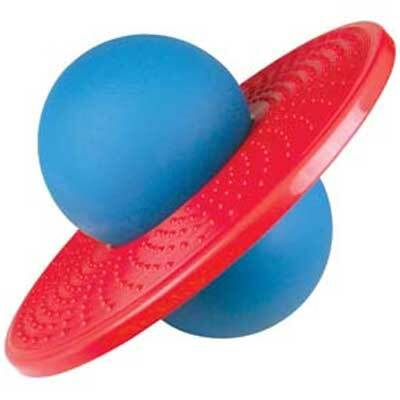 A Lolo Ball, also known as a Pogo Ball, Springbal, Lolobal, Disc-O or Pogobal, is a toy. It consists of a seamless figure-8 rubber ball locked into a structurally supported, sturdy plastic platform. To play with it, one stands on the plastic platform, balancing one’s weight on the bottom portion of the rubber ball, and jumps or hops around in the same manner as one would use a pogo stick. Invented by a small company in 1985, the lolo ball became a fad in the mid-1980s when Hasbro mass-produced it. Hasbro produced the toy until the early 1990s, and the lolo ball can still be purchased (made by other manufacturers) today. How can you say that doesn’t sell it on you? I bet you want to go out and buy one of the cheap chinese knock-offs of it right now. I must have harassed my parents the right amount. Too much harassing means you do not get something. Too little harassing means your parents forget about it and never get it for you. I must have used the right amount, because on Christmas day 1987 there was a Pogo Ball underneath the tree. We can start out that the commercial you watched above is a highly idealized scenario that was I believe was performed by circus acrobats. This thing was a pain to balance on. Hopping involved standing on the platform and gripping the ball with your feet hard enough it didn’t slip out. You could get a few hops in, but normally it slipped out after about three. The hops also were not as impressive as those in the commercial. It was all a sham. Glitz and glamour to sell useless pieces of plastic no one would want. If I had waited a little while longer, I could have tried out the pogo ball that school mates received for Christmas. Instead we had this toy that sat around the house and shed for at least four or five more years. Every once in a while one of the kids would try it out. They would get bored with it and back into exile it would go. This wasn’t the worse present I ever received, but it was disappointing to an eleven year-old me that I couldn’t be as cool as the kids in the commercial. AT least I was bright enough that I knew it wasn’t me, it as the Pogo Ball itself.